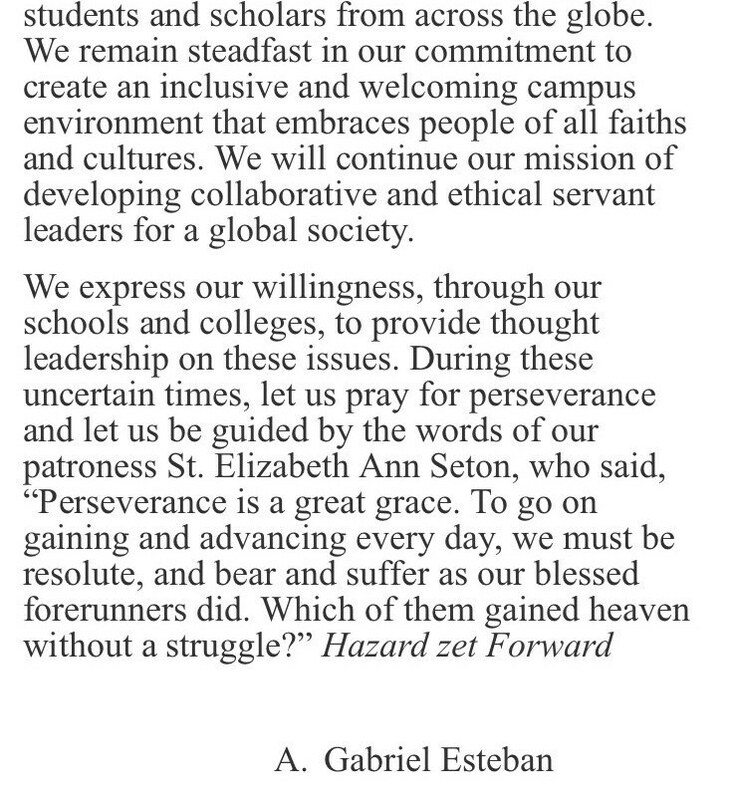 Seton Hall will continue to be an inclusive and welcoming institution dedicated to its students, faculty, and community members. In an amazing measure of solidarity, Seton Hall students gathered on the green Tuesday evening in an interfaith prayer. 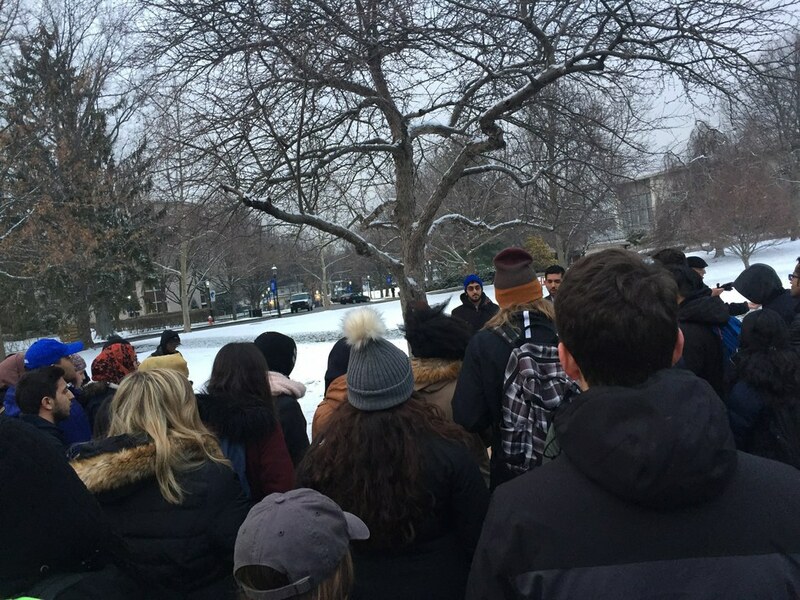 Students organized the "Vigil for Unity: Praying for A Welcoming America," which had a large turnout of students and faculty despite the snowy and windy evening with temperatures around 25 degrees. Monsignor Robert Wister and Deacon Philip Miceli offered a Catholic prayer and student, Thaha Sherwani, read from the Quran - both sharing the same peaceful message and asking for prayers for the President, for the country, and for all those impacted by the ban. We prayed for "refugees and migrants, the most vulnerable among us." It was great for the Seton Hall community to demonstrate interfaith solidarity during this tense and fearful period after the executive order was announced. The Archdiocese of Newark, Cardinal Joseph W. Tobin, C.Ss.R., issued a statement on the executive order, which was read at the vigil. He referenced Exodus 23:9, "God, through Moses told the people of Israel: 'You shall not oppress an alien; you well know how it feels to be an alien, since you were once aliens yourselves in the land of Egypt.'" Students were asked to bring protest signs if they had any to further show solidarity. One student had the popular line, "Jesus was a refugee," on his sign - which provided comfort and humor to the interfaith vigil. 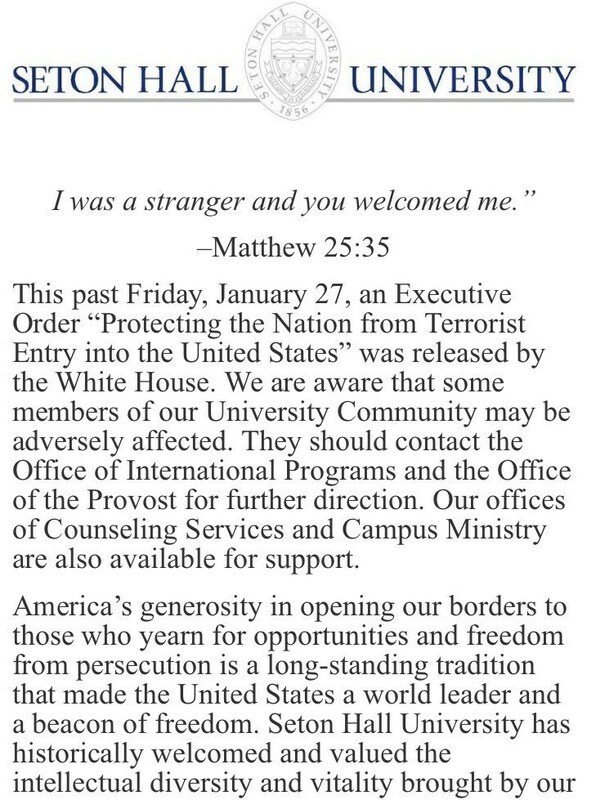 Hours before the vigil, Seton Hall President, A. Gabriel Esteban, released the following response on the executive order. One student said Seton Hall has five students who are from the impacted areas, and as President Esteban conveyed, the university will continue to be an inclusive and welcoming institution dedicated to its students, faculty, and community members. Hazard zet Forward - in spite of the hazards, go forward. Freeholder Assad Akhter, the first Muslim freeholder of New Jersey and Seton Hall alumni, and Prospect Park Mayor, Mohamed Khairullah, joined students and faculty to speak on the recent executive order. The video below are the inspiring conclusion remarks from Freeholder Akhter. I hope as a Seton Hall community we can continue to live as Cardinal Tobin remarked, "Even when...groups [are] met by irrational fear, prejudice and persecution, the signature benevolence of the United States of America eventually triumphed. That confidence and kindness is what has made, and will continue to make, America great."